Notice that to make a negative sentence in French is slightly more complicated than in English as there are two negative words involved. Notice that to negate a verb in a simple sentence, you wrap ne… pas around the verb (here suis / ai). Note: if the verb begins with a vowel, use n' instead of ne. You don't listen to Alice. ATTENTION: c'est becomes ce n'est pas. C'est bleu ? Non, ce n'est pas bleu ! Is it blue? No, that's not blue! Ce n'est pas très gentil de sa part. It's not very nice of him. We're not going to the cinema. Elle ne regarde pas la télé. She is not watching telly. Nous n'allons pas chez nous. -- We are not going home. Or,Nous ne venons pas de chez nous. -- We are not coming from home. Do you have a question Botatota? Wouldn't this be: elle ne regarde pas de télé ...using "de" after pas? using 'de' after the negation is when you negate the thing after the verb. In this case, the negation is about not watching so it is a simple negation of the verb 'regarder'. 'Je n'ai pas de frère' is about no brothers. The 'de' in this case is like 'any' in English. 'J'ai des frères.' I have brothers. 'Je n'ai pas de frères.' I don't have any brothers. It has nothing to do with the pas here. "He has not got a tv"
Why would it be Il n’a pas DE télé and not ....pas le télé? Why use “de” not “le”? 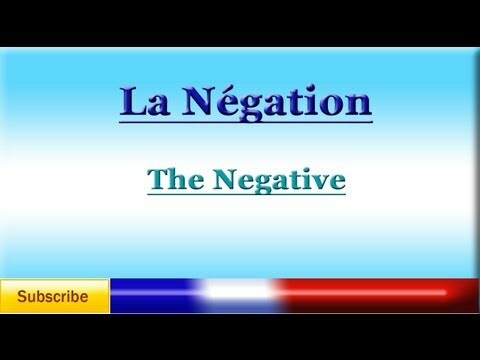 The rule in French is when you are using negation to say there isn’t any of something, the definite article goes away and is replaced by ‘de’. « Il n’a pas de télé. » means he doesn’t have a TV set. Il a une télé. means he has a TV. Similar to what happens in English when we say “He has some ideas.” When that is negated “He does not have any idea.” The word ‘some’ changes to ‘any’. It’s one of those idiosyncrasies of language. Hard to explain but when you start using it correctly, your French will sound so much better. Bonjour Advika ! Bravo ! Tu n'es pas indienne, donc d'où viens-tu ?